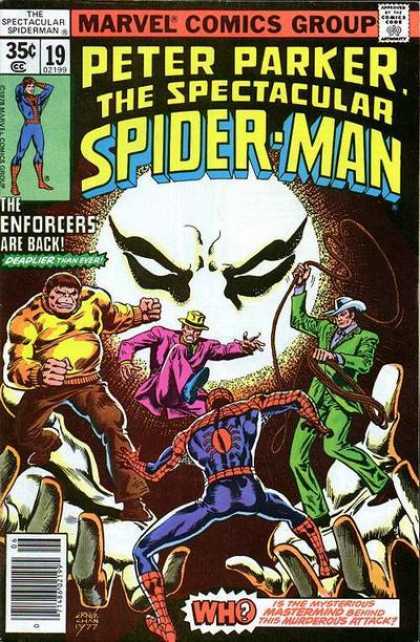 The series was launched by writer/editor Gerry Conway and artist Sal Buscema and Mike Esposito. Buscema drew the title until mid-1978. After Buscema�s departure, a succession of artists (including Mike Zeck, Jim Mooney, Ed Hannigan and Greg LaRocque) penciled the series for approximately five years. 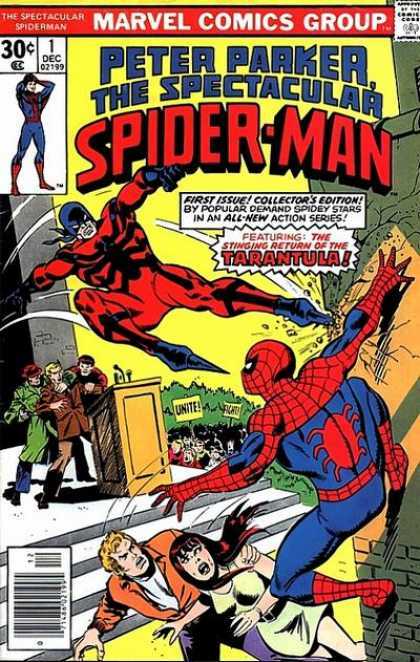 Frank Miller, who would later become the artist on Daredevil, first drew the character in Peter Parker, The Spectacular Spider-Man #27. 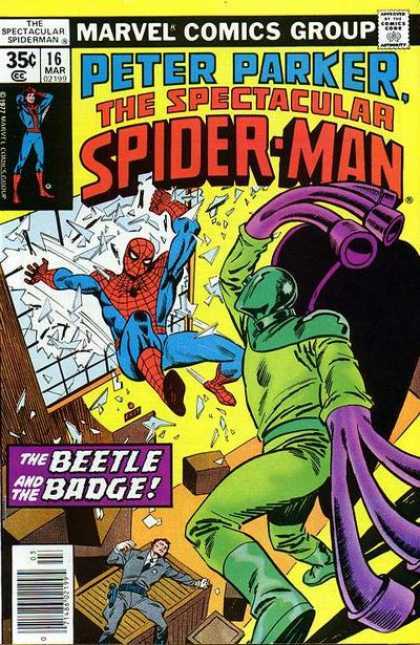 Scripting initially alternated between Conway and Archie Goodwin until mid-1977, when Bill Mantlo took over. During the this era of Spectacular, the stories focused more on Parker's campus life as an undergraduate student/teacher's assistant at Empire State University, and giving more attention to his colleagues than to the more long-running supporting characters in Amazing. Mantlo's first run on the title featured frequent appearances by The White Tiger, Marvel's first superhero of Hispanic descent, and the first appearance of the supervillain Carrion. He used the series to wrap up unresolved plot elements from The Champions comic book series and concluded his first run with a crossover with the Fantastic Four #218 (May 1980). Mantlo was succeeded by Roger Stern, who wrote for the title from #43 (June 1980) to #61 (December 1981). 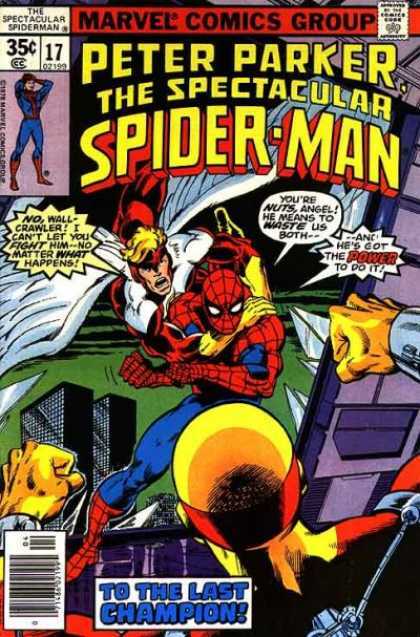 When Stern departed to write for The Amazing Spider-Man, Mantlo returned to scripting Peter Parker, The Spectacular Spider-Man; Mantlo's second tenure at the title lasted until April 1984. Mantlo's second run introduced the superhero duo Cloak and Dagger, created by Mantlo and Hannigan in Peter Parker, The Spectacular Spider-Man #64 (March 1982), and included a story arc which took place from issues #73-79 (Dec. 1982-June 1983), in which Doctor Octopus and The Owl compete for control of the New York underworld, Octopus almost destroys New York with a nuclear device, and the Black Cat is critically injured. Issue #86 (January 1984) was part of the "Assistant Editors Month" event and featured a story drawn by Fred Hembeck. 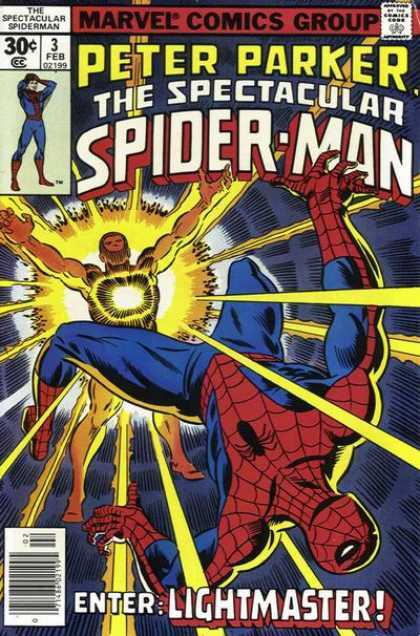 Al Milgrom took over scripting as well as art on the title with issue #90 (May 1984) and worked on it through #100 (March 1985). Milgrom imbued the book with a more whimsical tone, for example, pitting Spider-Man against The Spot, an enemy so ridiculous he gave Spider-Man fits of laughter. Jim Owsley, then editor of the Spider-Man books, disapproved of this approach and had Milgrom replaced as writer by newcomer Peter David in 1985. David and artist Rich Buckler, said Owsley, had the series "focusing on stories with a serious, 'grown-up' tone and more complex themes". The most notable story arc of the David/Buckler era is "The Death of Jean DeWolff" (#107-110, Oct. 1985-Jan. 1986), in which Spider-Man's ally, NYC Police Captain Jean DeWolff - a supporting character in the Spider-Man comics since 1976 - is murdered by the vigilante/serial killer the Sin-Eater. This multi-part story guest-starred Daredevil. The "Kraven's Last Hunt" storyline by writer J.M. DeMatteis and artists Mike Zeck and Bob McLeod crossed over into Peter Parker, The Spectacular Spider-Man #131 and 132. 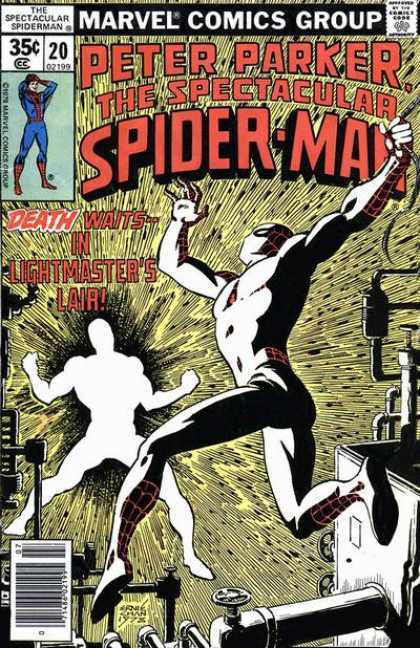 After his "Return of the Sin-Eater" arc (#134-136, Jan.-March 1988), Peter David was removed as writer. Editor Owsley said editor-in-chief Jim Shooter "disliked Peter's work intensely". David, in a 2005 interview, believed, "I was fired off Spider-Man because it was felt at the upper editorial level that a novice comic-book writer shouldn't be handling the adventures of Marvel's flagship character". Former series writer Gerry Conway, who additionally wrote Web of Spider-Man from 1988 to 1990, returned to Spectacular after which he left both books to become a story editor on the TV series Father Dowling Mysteries. Conway stated in 1991 that "I understand the character a lot better now than I did when I was nineteen. And one of the nice things about the Marvel characters is that you can keep them fresh by changing them just a bit." His 1988-1990 run on Spectacular included such story arcs as the "Lobo Brothers Gang War", and the conflict between Daily Bugle editor Joe Robertson and his former friend, the albino criminal Tombstone. J. M. DeMatteis became the regular writer in mid-1991, injecting a grim, psychological tone into the book (in the same style as the DeMatteis-written "Kraven's Last Hunt", a six-part collaboration with artist Mike Zeck that crossed over the three Spider-Man titles in 1987). DeMatteis began his run with the story arc "The Child Within" (#178-184, July 1991-Jan. 1992), featuring the return of the Harry Osborn Green Goblin. As written by DeMatteis, Harry sank further into insanity and gained the same super-strength possessed by his father, battling Spider-Man again in #189 (June 1992), before being killed in #200 (May 1993). 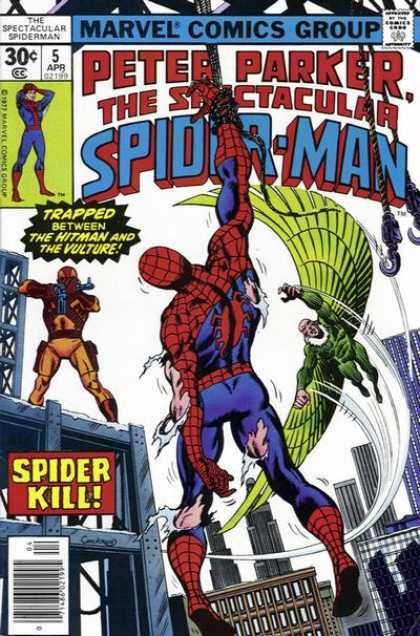 In an undated 2000s interview, DeMatteis said, "I really loved the two years on Spectacular Spider-Man that I wrote with Sal Buscema drawing. Talk about underrated! Sal is one of the best storytellers and a wonderful collaborator. I loved that run." 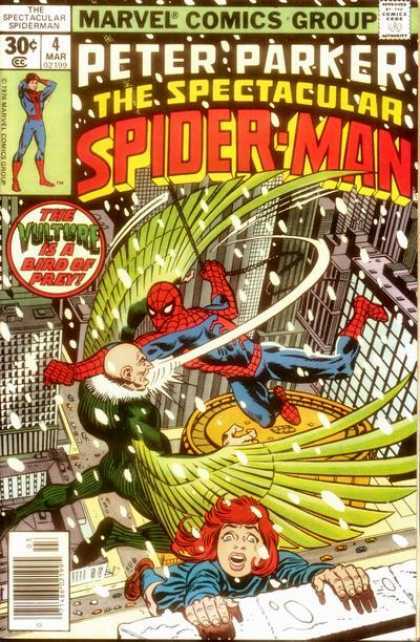 DeMatteis left the book in mid-1993 to write The Amazing Spider-Man. Steven Grant and other writers followed through late 1994, when former Amazing Spider-Man writer Tom DeFalco took over. By this time, all the Spider-books were affected by the controversial "Clone Saga" that culminated with Spectacular Spider-Man #226 (July 1995). This story revealed (though it was later reversed) that the Spider-Man who had appeared in the previous 20 years of comics was a clone of the real Spider-Man. 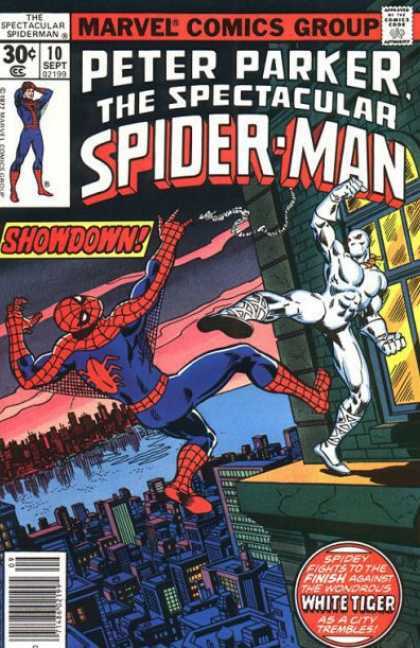 This tied into a publishing gap after #229 (Oct. 1995), when the title was temporarily replaced by The Spectacular Scarlet Spider #1-2 (Nov.-Dec. 1995), featuring the "original" Peter Parker. The series picked up again with #230 (Jan. 1996). Todd DeZago then wrote for a year before DeMatteis returned through May 1998. Luke Ross succeeded Sal Buscema as the artist and remained until the series ended, but there was no regular writer for the last half-year with Glenn Greenberg, Roger Stern, John Byrne and Howard Mackie all contributing during this time. The final issue was #263 (Nov. 1998).